Why did the police arrest the turkey? They suspected it of fowl play. What did the mother turkey say to her disobedient children? If your father could see you now, he’d turn over in his gravy. Our turkey was sick. All day long it had a thermometer in it. What do you get when you cross a turkey with a banjo? 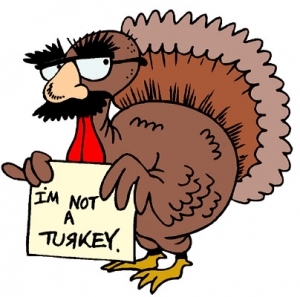 A turkey that can pluck himself! Why do turkeys always go, “gobble, gobble”? Because they never learned good table manners! What sound does a space turkey make? Hubble, hubble, hubble. Using a new recipe, my wife put the turkey in aluminum foil. She had to roast it until it was brown. Twenty-four hours later, the aluminum foil was still silver. Every year around Thanksgiving and Christmas you see such helpful articles on “How To Carve A Turkey”. And, they’re really practical. Now, if I can only find a butcher who sells those turkeys with the dotted lines on them. Why are the cranberries red? Because they saw the turkey dressing! Have a happy Thanksgiving all! Gobble, gobble!